No Holiday from Climate Change - Planet Aid, Inc. Whether you were out on a boat, watching a parade, or just sitting out on your back porch this past July 4, you probably noticed the extreme heat of the holiday—and not just the standard warmth of a July day. If you did notice it (and the sweltering heat of the days before and after the holiday), you’re not alone. More than 113 million Americans were under heat warnings and advisories during the week of the Fourth. And, it didn’t stop with the United States. Simulation of maximum temperatures on July 3 from American (GFS) weather model at two meters above the ground. From Climate Reanalyzer (http://cci-reanalyzer.org) Climate Change Institute, University of Maine, USA. Africa experienced a record-breaking temperature on July 5 as the temperature in Ouargla, Algeria was measured at 124.3 degrees (51.3 Celsius). The previous record of 123.3 degrees (50.7 Celsius) was set in Morocco in July of 1961. Surface temperatures in Northern Siberia, Northern Canada, Scandinavia, and the Arctic measured 15 to 30 degrees (8-17 Celsius) higher than normal, with temperatures in some areas of Siberia (near the Arctic coast) rising to over 90 degrees (32.2 Celsius). High temperatures in Quebec, Canada caused 54 deaths last week. Temperatures as high as 95 degrees (35 Celsius) were recorded, a high-risk temperature for those without air conditioning (common in the cooler regions of Canada). Overall, more than 650 records were broken in the U.S., approximately 220 for high temperature, and 450 for highest minimum temperature. For example, Burlington, Vermont, broke its highest low temperature record on the night of July 2, as the temp never dropped below 80 degrees (27 Celsius). While summer comes with heat, this is more than expected. It’s clear from reports around the globe that it was hot everywhere, pointing to the conclusions that climate scientists came to long ago: global temperatures are rising and humans are the reason. Weather extremes are to be expected as the globe continues to warm. This is just another example to add to the growing pile of catastrophic weather events happening all over the world. It’s time to make a change, protect the environment, limit the use of fossil fuels, and be a voice for the Earth. There are numerous organizations and events working to do just that, but there is a stand-out movement happening right now with America’s youth. Recent research shows that 31 percent of 18 to 34 year olds are “extremely worried about climate change,” while the average for all ages is at 25 percent, and 19 percent for those over 65 years old. This higher amount of worry over climate change is leading to youth activists around the world that are determined to make change happen. Along with the main march in D.C., there are sister marches taking place across the country and a lobby day on July 19. The lobby day will be a time for youth to gather together and implore the U.S. government to take a stand on climate change and create progress. 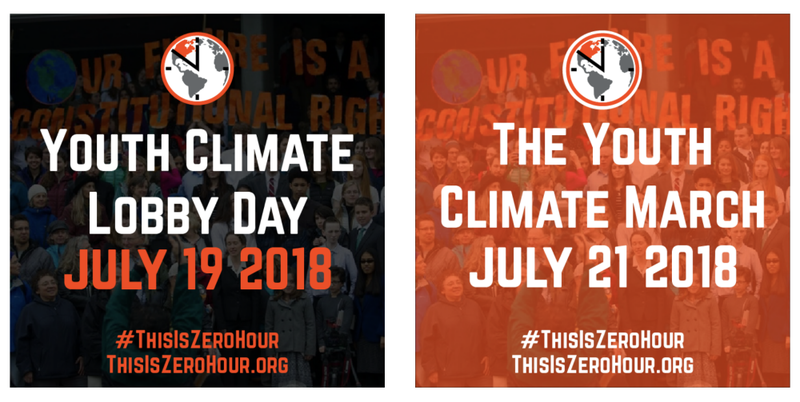 Learn more about Zero Hour, the march, and the lobby day at thisiszerohour.org.